Marking this special occasion, students of Ruskin Park Primary School and staff from Yarra Valley Toyota, along with Liz Watson, Melbourne Vixens Netballer got their hands dirty with planting activities at the school, as part of what has become Australia's largest community tree planting and nature care event. Not-for-profit environmental foundation, Planet Ark, has again partnered with Toyota and its extensive national dealer network to get both communities and schools across Australia involved in the initiative. Through Schools Tree Day and National Tree Day, which falls two days after on Sunday 30th July, Planet Ark and Toyota hope to educate the nation on the value and importance in preserving the environment. Yarra Valley Toyota have a long association with National Tree Day and more specifically Schools Tree Day and this will be our fifth year in association with Ruskin Park Primary School. So far more than 470 trees have been planted at Ruskin Park with another 150 to be planted this year. Tree planting day at Ruskin Park has provided the school with a large number of indigenous plants, creating a variety of engaging outdoor teaching spaces. At least half of the planting this year was indigenous natives, and the other half Australian natives to encourage habitat closer to the classrooms. We also planted a number of deciduous saplings near the oval and play spaces to increase our shaded areas, which is important for our students, community groups that utilise our facilities and the environment in general. Maroondah Council kindly donated trees again this year, and Bunnings has also assisted with our spring planting programs by donating seedlings and staff time to plant out our edible forest and garden in spring. Ruskin Park Primary School is environmentally minded and the School's Principal, Mr Andrew Moore is proud of their growing garden club. 'Our garden club is popular amongst our students. We have a dedicated and passionate group of parents who provide valuable support and offer our students the opportunity to grow a variety of herbs and vegetables. We are currently in the process of creating an edible forest garden and have a specialist speaker coming out this term to inspect the forest garden and give some tips and advice'. School spokesperson, Ms Pauline Lane also advised that the school's classrooms and after care program utilise a bokashi composting system to compost suitable food waste. Bokashi composting is an anaerobic process that relies on inoculated bran to ferment organic material in a tightly closed container. All the compost created is utilised at the school grounds. 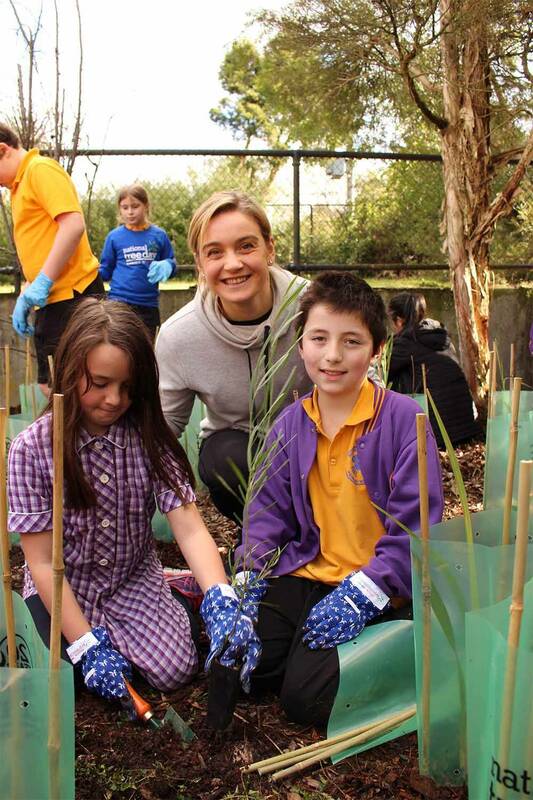 Since 1996, National Tree Day and Schools Tree Day have been responsible for planting well over 23 million trees, plants and edibles with 3.8 million Australian's donating their time throughout the years. In 2015 alone, more than 300,000 Australians pitched in across some 3,600 sites with over 1.2 million plants added to local communities. Debbie Agnew, spokesperson for Planet Ark, said: "To see National Tree Day reach its 22nd year is very exciting. For more than two decades, Australians have stood behind the initiative and made a real contribution to the health of their local communities and the environment. With the support of Toyota and its dealer network, National Tree Day is sure to go from strength to strength and continue to provide a needed boost of nature for many Australians." Dealer Principal, Danny Heffernan added: "Toyota has a long tradition of supporting local communities and National Tree Day is a great way for us to give something back."